A gargoyle is a decorative ending of a roof gutter, from which the water can be drained freely. It is mounted on an outflow pipe that drain the water from the roof – usually a few meters above the ground, in a conspicuous place. During rainfall the gargoyle spectacularly “breathing” water, which is a one of a kind scene. What materials are the gargoyles made of? All our products are made of sheet copper or sheet zinc – a gargoyle can therefore bear a warm, copper colour, or a cold, steel tone of zinc. All three available standard models can be made of any of those sheet metal. Do the gargoyles vary in size? Gargoyles themselves are in a similar size, however the diameter of the outflow pipes will vary. 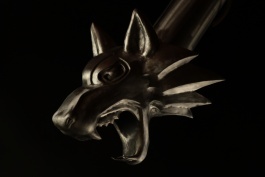 The most common size is 100 mm diameter, but without any additional charges we will also produce gargoyles suitable for 60, 70, 80 or 90 mm diameter. Larger diameters are also available, but it involves an increase in the price of the service, because the sculpture itself have to be larger. How are the gargoyles mounted? 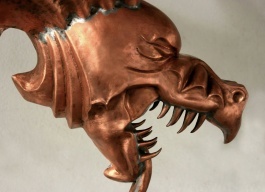 Gargoyles can be mounted using rivets, by soldering, welding or other fastening system. A roofing company should be able to install any of the components without much difficulty. The diameter of an outflow pipe is made 2 – 3 mm larger, so the sculpture overlaps pressing the pipe, what makes the installation easier and is in compliance with the roofing principles. What is worth considering before buying? The most important factor conditioning the purchase should be the metal that the gutter is made of: for zinc gutters the zinc gargoyles should be applied, for copper ones – copper gargoyles. In case of steel or aluminium gutters zinc remains as the only suitable metal – unlike copper – it does not cause electrolytic corrosion in contact with other metals. Do you produce custom gargoyles? Yes. If you have your own idea for a gargoyle, we will almost surely be able to realize it. All we need is some kind of reference (e.g. photo of the sculpture, on basis which the gargoyle should be modelled or a hand-made sketch), in order to make a free of charge initial design and cost estimation. A gargoyle inspired by a dragon motif. It has huge, majestic wings, with a span of half a meter. It can be made to fit a 60 to 120 mm diameter pipe made of copper or zinc sheet. A gargoyle inspired by a lioness motif. It can be made to fit a 60 to 100 mm diameter pipe made of copper or zinc sheet. A gargoyle inspired by a wolf motif. It can be made to fit a 60 to 120 mm diameter pipe made of copper or zinc sheet.